"I think people respond to this character because he is very much like a Zen master - and I think everyone would love to have someone like him to talk to. Yoda is universally appealing." "Acting is acting, whether it is a human actor, a CG character, or a puppet. It's all the same. 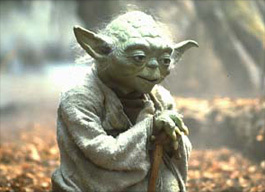 Most people think of Yoda as being real, because he is the height of puppet artistry. "After Frank Oz did Empire Strikes Back, I tried to get him nominated for an Academy Award; but we heard back that the Academy doesn't consider puppetry to be an art. I think it is an art - and Yoda represents the highest level of that art."